Happy Monday – I hope you all had a great weekend! I know I mentioned this on Instagram last night, but this weekend was a busy one for me. I played softball, worked on a couple of blog-related projects, had dinner at my friend’s house and attended a bridal shower. I also had the chance to meet my friend’s 9-week-old lab puppy, Buddy. As you can imagine, he was ridiculously adorable, so I wanted to take him home with me! It’s okay though, my two little guys are cute, too. Can we just take a second to admire the fact that I’m wearing legitimate vintage Levis denim? 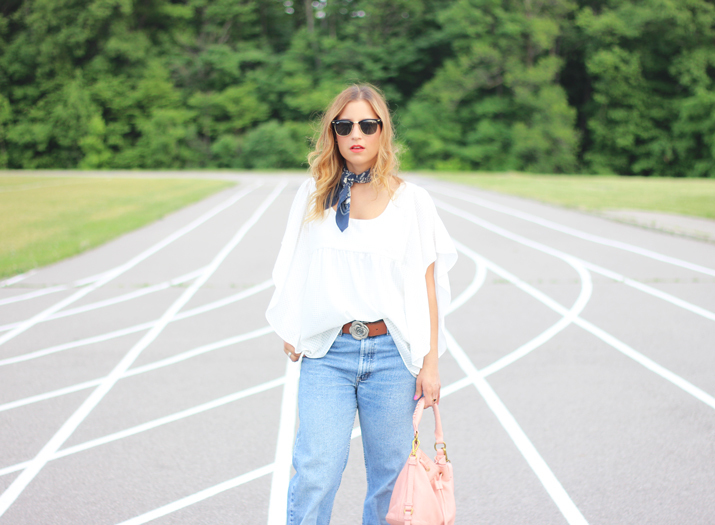 Yes – vintage Levis, as in…used! I’d love to tell you that they were thrifted by yours truly, but they’re not. These jeans are from one of my favourite local brands, preloved. When I found out that my friends at preloved had started to carry vintage denim, I knew I had to get my hands (err… bum) in a pair. I always envy the people who can go into a thrift store and come out with gems, but I seem to lack that skill. 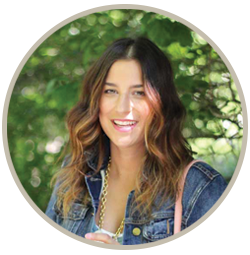 Not only does the preloved team have an eye for thrift-worthy pieces, but considering a majority of their line is made up of reclaimed vintage fabrics, vintage Levis denim is right in their wheel house. I paired my vintage Levis with a flow-y top and platform heels for a girly, modern vibe, but you could take the vintage theme one step further and pair them with a crop top and funky sneakers. You can also embrace your inner 90’s chick, by wearing a distressed tee with your denim and tying a flannel shirt around your waist. At the end of the day, it’s denim, so the options are endless! The only word of caution I have is to take a look at the sizing chart before you place an order. Vintage denim fits much smaller than modern denim, so you will have to go up a few sizes. I guess vanity sizing is a product of the 21st century? I’m also excited to share an exclusive deal with you! From Monday June 13 to Monday June 20, you can get 40% on getpreloved.com, using the code JACKIE40. In addition to the vintage denim, they have so many cute pieces in stock right now. I have my eye on this top, as well as this one! Oh, and if you liked the dress I wore in this post, you can shop it here. Don’t forget! From Monday June 13 to Monday June 20, you can get 40% on getpreloved.com, using the code JACKIE40. Happy shopping! You are so rocking the vintage Levi’s! I love how you styled it! Vintage Levi’s – how cool are you?! Such a fun look. Glad you had a fun weekend. love the classic levi’s they legit have the best denim. Thanks!! I can see why they last forever, too! I’m in love with these Levi’s on you! and that bag is too pretty! 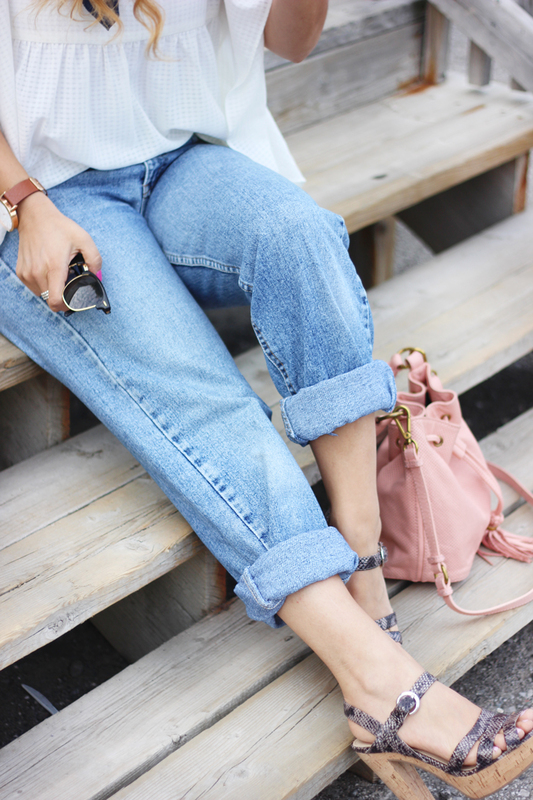 You fabulously presented up cycled Levis a classic nostalgic jean…. , the accessories perfect classic timeless…..you are a rockin it Jackie! Thank you so much, Jhann!!! Those jeans look so comfy and soft! I also love the belt buckle! So cute! I’ve always wanted a pair of really good vintage jeans! These photos are seriously gorgeous! SO stunning! And I’m dying over your vintage jeans! Love the whole look. I love all the trends that you’re rocking here. Great styling with the scarf – adds a gorgeously polished detail to those great Levi’s! I love love everything about this look! First off, the jeans- how awesome that they are really vintage. 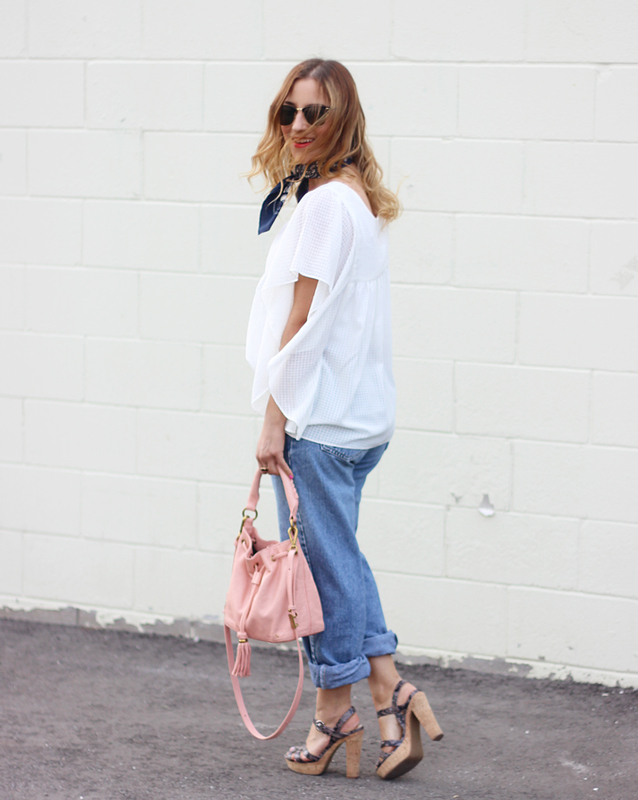 And then paired with this gorgeous flowy shirt and bandana- seriously good! You look awesome, Jackie! In love with all of it (I have the same same Target top 😉 styled with the vintage jeans, the cutest shoes too! 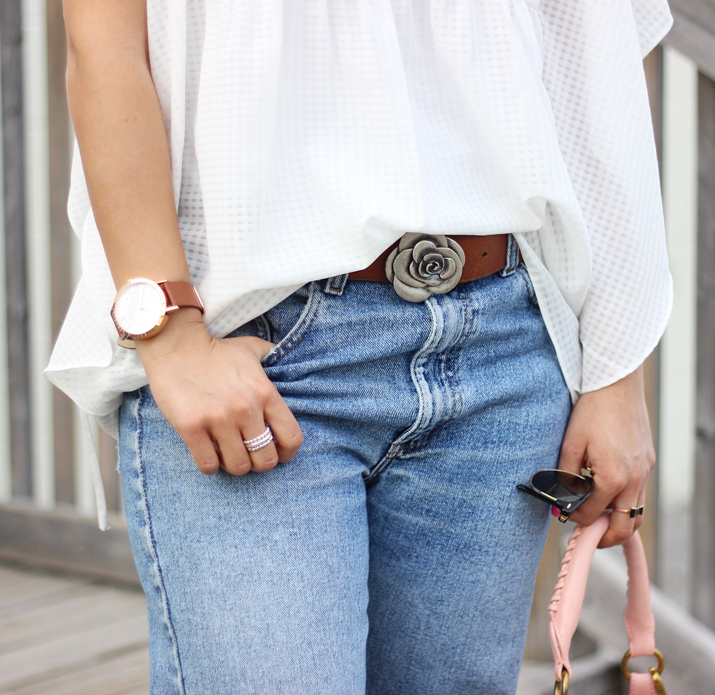 Love these jeans, lady- and your styling is on point. LOVE a bandana right now! Obsessed with these jeans! They look amazing on you and I need those fun sandals! Sounds like such a fun weekend, Jackie! And dang! 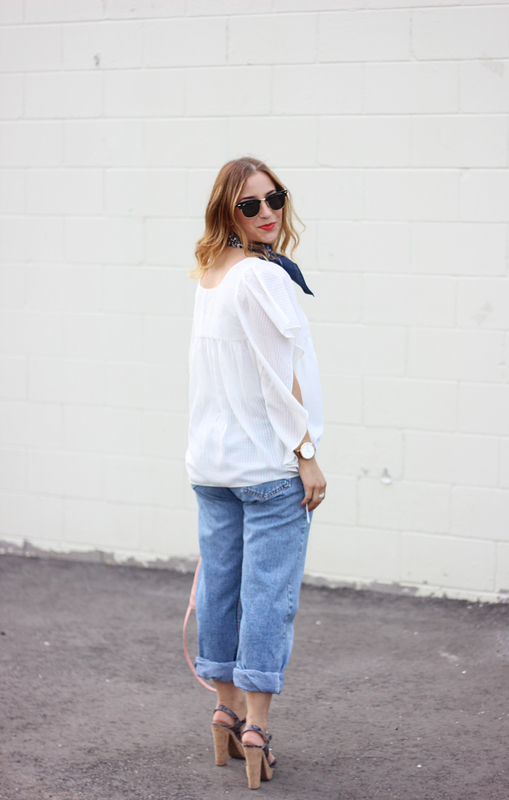 That is such a cool concept – these vintage Levis look great on you!